Curated Weekly Auctions offer a variety of items including art, furniture, collectibles and more. Many items start at a higher opening bid than our usual weekly treasure auctions. 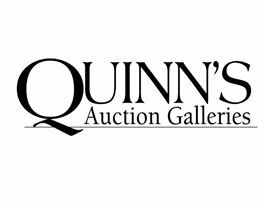 Visit our gallery at 360 South Washington Street, Falls Church Tuesday 4pm-7pm and Wednesday 10am-6pm to preview this week's items or visit our website at www.quinnsauction.com to view the catalog online.